IgniMagnus: Controlling the chaos in magic. Seriously, what gave you the impression you could bargain with Cthulhu? What makes you think that you can control all the vibrations in Indras net when you step right in. Every nervous system has its limits to the range of sensory perception. What lies in the ultraviolet light? What lurks in the frequencies that we can't tap into? "You look more radiant every day madam Cury." How many sacrifices did it take to learn about radiation what we take for granted today? Even when you stretch your perceptual acuity and your sensibility there are always limits. There is always more we don't know than that we know. There is always more happening than that we can comprehend. 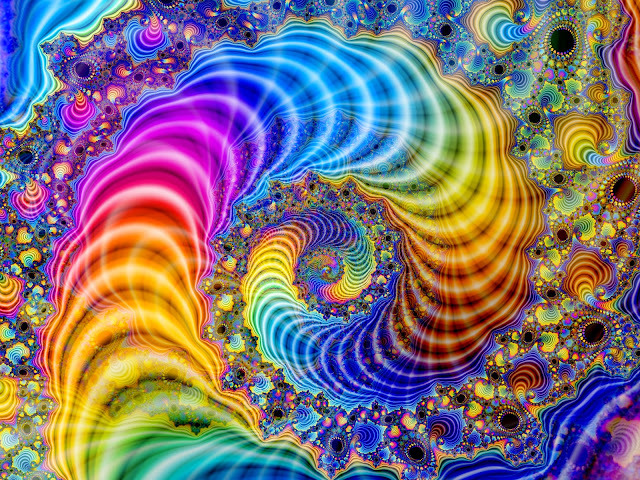 Dynamic systems have chaotic solutions in a universe that is fractal with exponential growth. Now , I know this is a sentence with a lot of big words but this isn't' a Deepak Chopra quote, Understanding the basics of dynamics systems and cybernetics, chaos theory, fractal math and exponential growth is cruel in working with chaos. Many people who are into Chaos magic also have shown much interest in the work Nassim Nicolas Taleb did into living in a world of incomplete information, chaos, antifragitlity and black swans. "The black swan theory or theory of black swan events is a metaphor that describes an event that comes as a surprise, has a major effect, and is often inappropriately rationalized after the fact with the benefit of hindsight. The term is based on an ancient saying which presumed black swans did not exist, but the saying was rewritten after black swans were discovered in the wild."-wikipedia. We often tend to explain non-linear unpredictable things in hindsight as linear and predictable. This is best to keep in mind when working with magic it seems to me because magic is (thinking that we are) making linear connections with "forces" in a non-linear universe. Ofcourse Chaos magicians know that you can use anything to make a meaningful connection as long as you make it meaningful. This is the benefit of a fractal universe, everything reflects everything else. As explained in my other post about magic, anything can be used as a source of a greater "power". It are the connections that give it power, how you connect to the item you are working with and how that item is a part of, is related to, something bigger than itself. Yet, even when we have the wanted result in magic it would be unwise imo to think that the results are restricted to what you can perceive or that when a ritual or other magical working fail that therefore nothing happened. But what does this mean practically? What does this change for me practicing magic? It may seem reasonably abstract at first but changing understanding changes the boundaries of the concepts we can work with and it changes how we relate to things. It can be that you are accumulating small undetectable changes in a vast network that could suddenly give exponential results. It can be that what the spells you left unfinished keep reverberating and that what you delete sends out a signal from the beginning of time to infinity. I am using exaggeration to make you stretch your imagination of possibilities. Train your peripheral thinking and understanding of the world. We can learn where our functional fixedness lies and soften or remove those boundaries. No matter how much we learn there is always more to learn. No matter how much you control don't get cocky and overreach. About reach of power, Nicolas Taleb had the following to say, that the control of power should be given to the smallest unit that can handle it. That way the bigger system can gain from the failure and/or fragility of the smaller. Small conflicts between smaller parts give more resilience to the bigger unit. When a too big part takes control of power it can damage the resilience of the smaller parts and therefore make the larger system more fragile in the end. So who are you trying to summon and for what goal and ends? What is it reach and where can it overreach? How much are you in control of your magical practise and how much is in your control of you? Micromanaging does more damage than that is beneficial to the system. So where do we need to draw the line? It comes back to the smallest manageable part again. Maybe it can help to think in terms of min-maxing. May the For... Chaos... entrance you and inspire you to learn more.